Eating with others not only has health, nutritional, mental and social benefits, it’s also good for the soul. This can be especially important for older members of our community, when social isolation can cause feelings of loneliness which in turn can lead to illness. 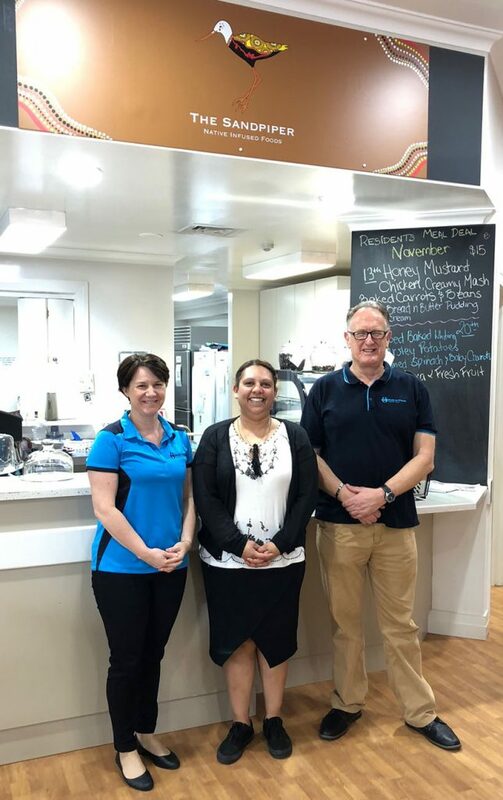 Meals on Wheels Central Coast (MOWCC) are helping to combat the effects of social isolation with the addition of a new Community Restaurant at their Woy Woy outlet. Opening on Friday 3 May, the Community Restaurant will run from 9.30am to 1.30pm and will offer not only a choice of meal options including morning tea, hot lunch and dessert, but also bingo, games and entertainment. At a low cost of $12, this is an ideal way to mingle with others, make new friends and combat social isolation. Transport can also be arranged for those needing this service. The MOWCC Community Restaurants have served up nutritious meal options for many a year, attracting local members of the community who attend on a regular basis. This new restaurant will be a welcome addition to the established ones at Bateau Bay (Tuesdays and Thursdays), Woy Woy (Tuesdays) and West Gosford (Fridays). “Our Community Restaurants provide much needed social interaction for our clients,” said Dennis Taylor, CEO of Meals on Wheels Central Coast. “Our attendance rates are consistently high, and due to this high demand we have decided to launch a new Restaurant at our Woy Woy outlet. “We look forward to welcoming members of our community to Woy Woy, so they can enjoy some nutritious meal choices from our specialised Community Restaurant Menu’s as well as some social interaction,” Mr Taylor said. This is just one of the social support mechanism’s that MOWCC have in place for their clients, with volunteers performing regular welfare checks during meal deliveries to homes across the Coast, many of them staying for a cup of tea and a chat. Along with assisted shopping and a Peninsula shopping bus, Meals on Wheels Central Coast really is ‘more than just a meal’. For more information on their Community Restaurants, meal delivery and social support programs, please visit www.ccmow.com.au or call 4357 8444. Bookings to attend Community Restaurants are essential. Posted on February 21, 2019 at 9:52 am. Meals on Wheels Central Coast is giving service providers and potential clients the opportunity to ‘try before they buy’ at an Open Day at their Woy Woy outlet on Thursday 7 March. The iconic Central Coast Company will throw open its doors between 11am and 1pm, with prospective clients, their families and carers, as well as service providers from around the Coast expected to visit. 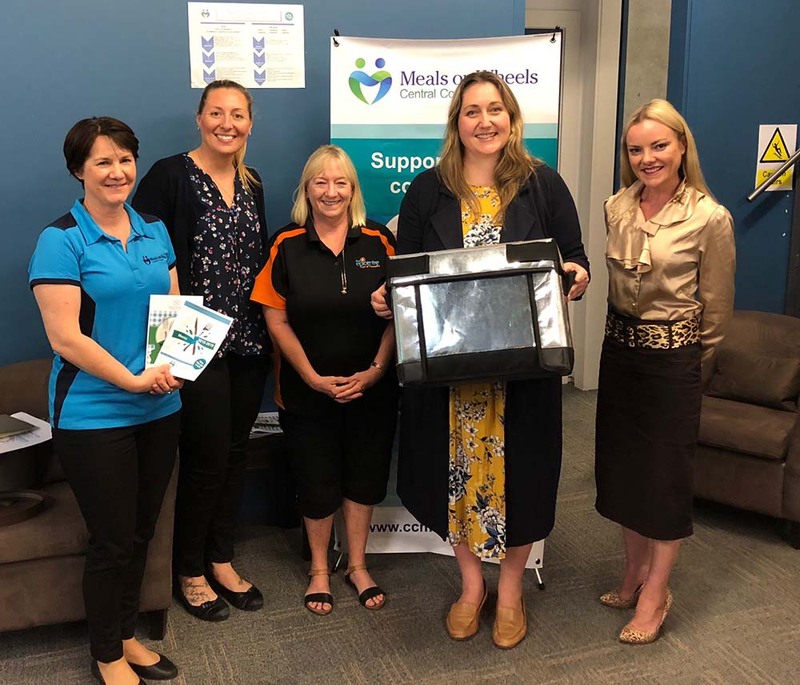 There will be information available to visitors on the myriad of services on offer by Meals on Wheels Central Coast (MOWCC). Known for their catch phrase, ‘More than Just a Meal’, this iconic Central Coast Company offers not only meal delivery, but social support via their Flexi Foods and Community Restaurant programs. Being a NDIS registered Company, they can also make meal planning easier for those with NDIS plans. For those interested in what the food is actually like, there will be the opportunity to partake in some taste testing, with one of MOWCC’s suppliers, The Good Meal Co, in attendance to hand out samples. Information will also be available regarding home care package and NDIS plan assistance with members of the MOWCC team on hand to answer questions about the services on offer. Meals on Wheels Central Coast’s CEO, Dennis Taylor, said Open Day is a great opportunity to show the community that they really are ‘more than just a meal’. “We have been a vital part of the community for over 50 years now, and are trusted by over 700 Central Coast residents and their families,” he said. “Our Open Day will reaffirm to the community that we are here to stay and show them that we can assist with not only delivery of meals, but the essential social support mechanisms that many miss out on. “Being NDIS registered, we can also assist those who have meals listed on their NDIS plan. They can be assured that they will receive quality Australian produced meals at a very competitive rate,” Mr Taylor said. The MOWCC Open Day will be held on Thursday 7 March, from 11am to 1pm at Meals on Wheels Central Coast, Yaringaa Building, 93 McMasters Road, Woy Woy. To register your interest email marketing@ccmow.com.au or call 0447 074 161. Posted on February 8, 2019 at 9:39 am. Seniors across the Central Coast will be increasing their fitness and flexibility over the next couple of weeks in Gentle Movement classes hosted by Meals on Wheels Central Coast as part of NSW Seniors Festival 2019. Held in conjunction with Insight Exercise Physiology, classes will be held at Toukley and Woy Woy and will run for an hour duration. There will be no charge for these gentle movement sessions with light refreshments also provided. Posted on November 15, 2018 at 9:52 am. Every Friday at Evergreen Life Care’s Community Centre, a group gathers in the function room. As attendees of Meals on Wheels Central Coast’s Community Restaurant, they are treated to a delicious hot meal and dessert, before playing games such as bingo and trivia. The Community Restaurants are an important aspect of the work that Meals on Wheels Central Coast do in the local community and the provision of a healthy, well balanced meal forms an essential part of this social activity. Following a hot main meal, patrons are treated to a homemade dessert, created by owner of The Sandpiper, a café located within the Evergreen Life Care Community Centre. Wandid Young, from the Wadi Wadi tribe of the Yuin Nation on the South Coast, has lived on the Central Coast for 35 years, and is not only actively involved in the local Indigenous community, but she has enjoyed serving up her treats to the community for the last couple of years from her Café. Knowing what the Meals on Wheels Central Coast clients enjoy is at the front of Wandid’s mind. Only serving up food that she knows is delicious, Wandid has also introduced some native herbs to her cooking, giving the Community Restaurant attendees a taste of her culture. “The customers at the Community Restaurant thank me for the desserts on their way out. During my time at The Sandpiper I’ve served up Wattle Seed based Cheesecake and Anise Myrtle Polenta Cake and everyone enjoys the subtle flavours in them”, said Wandid. Meals on Wheels Central Coast and Wandid work together in The Sandpiper Cafe every Friday, Wandid allowing the Community Restaurant to do meal preparation whilst she works alongside them. The arrangement has suited them both well, and with Wandid now serving up desserts to accompany the meals, they both look forward to further developing their relationship. “We are pleased to have built up a relationship with Wandid Young, the owner of The Sandpiper” said Dennis Taylor, CEO of Meals on Wheels Central Coast. “Our aim is to provide a nutritious and well balanced meal to our Community Restaurant customers, and Wandid’s produce has added extra value to this important social program. “We look forward to working with Wandid and Evergreen Life Care in the future to further cement our working relationship”, Mr Taylor said. Meals on Wheels Central Coast run 4 Community Restaurants a week. The Community Restaurant at Evergreen Life Care at West Gosford is held on Fridays between 10am and 2pm, with additional Community Restaurants being held at Bateau Bay on Tuesdays and Thursdays between 10am and 2pm, and Woy Woy on Tuesdays between 9.30 and 1.30pm. Posted on November 7, 2018 at 12:48 pm. Thank you to Emma McBride MP, Federal Member for Dobell, and Councillor Jillian Hogan from Central Coast Council for visiting us today. We are excited about collaborating together on youth volunteering initiatives for our community. From L to R: Pip Wilson and Ashleigh Rudder from Meals on Wheels Central Coast, Councillor Jillian Hogan, Emma McBride MP and Natalie Jenkins, Director, Meals on Wheels Central Coast Board of Governance. Posted on October 24, 2018 at 1:19 pm. Posted on September 6, 2018 at 12:34 pm. We are grateful to the NSW Business Chamber for shooting this video at our Community Restaurant at West Gosford. With energy savings of $11,000, we are able to serve up an extra 3,000 meals per year. Posted on August 31, 2018 at 10:20 am. 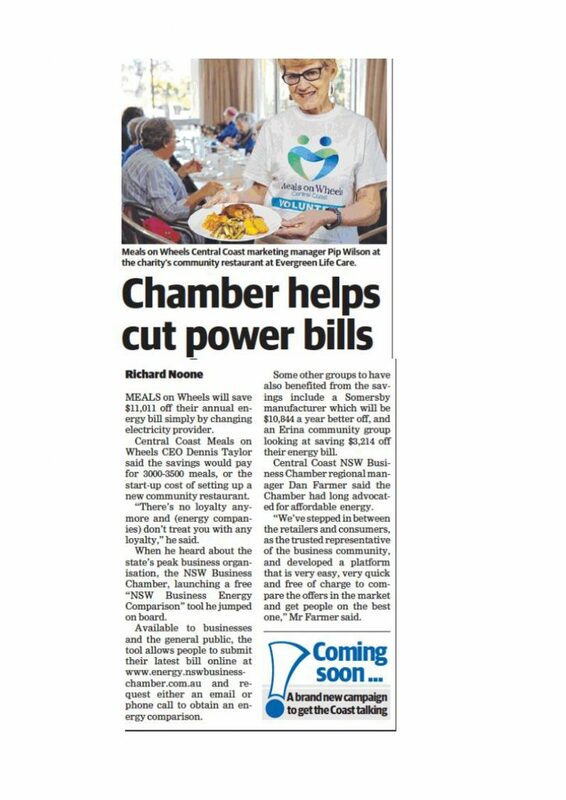 Thanks to the NSW Business Chamber and their energy savings comparison tool, we are able to serve up more meals to our community. Take a look at this article that appeared in the Central Coast Express Advocate on Thursday 30 August 2018. Thanks to our volunteer Glennis who appears in this photo. Commuters, working parents, single people, shift workers, baby boomers … there are so many busy Coasties who can use a hand when it comes to dinner time. This is what local company Coast Cuisine had in mind when they launched their range of convenient meals this week. Developed to support the iconic brand that is Meals on Wheels Central Coast, Coast Cuisine brings to the table an array of gourmet style products, aiming to make Coasties lives a little easier with their readymade frozen meals. “Coast Cuisine came about after a group of Coasties got together and contemplated how they could make life easier for people just like them,” said Dennis Taylor, Head of Operations at Coast Cuisine. The Coast Cuisine team is excited about the range of products that they will be offering, ensuring that wherever possible local and Australia wide produce has been used. All meals are frozen and will be delivered directly to clients doorsteps, with an option also available to pick up orders from the Tuggerah premises. “The product Coast Cuisine is presenting is big on taste yet still affordable and competitive. With the added factor that all Coast Cuisine sales support Meals on Wheels Central Coast, we are sure that the local community will get behind us and give our products a go” Mr Taylor said. Posted on August 9, 2018 at 11:33 am. Meals on Wheels Central Coast is planning for the future, with initiatives in the pipeline to help this iconic brand continue its vital services to the local community for years to come. One such initiative is the formation of One Direct Advisory Pty Ltd. A wholly owned subsidiary of Meals on Wheels Central Coast, One Direct Advisory will provide its services to organisations offering its advisors’ extensive knowledge to steer them through the new business environment that is evolving. Offering advice to small to medium businesses in the not for profit and for profit sectors, the eight advisors in One Direct Advisory will use their skills gained through years of experience to cover mergers and amalgamation, governance advice, business and financial analysis, corporate and finance structures and marketing and business plans. One Direct Advisory’s clients will gain professional advice at a much lower cost than their competitors. “This is a significant initiative for Meals on Wheels Central Coast,” said Dennis Taylor, Chief Executive Officer. “We need to plan for our future to ensure that we can continue our good work in the community, and One Direct Advisory will help serve that purpose. One Direct Advisory will provide a free initial consultation to fully understand the requirements and needs of individual projects, working out a schedule to cost effectively assist small and medium sized businesses. The team members of One Direct Advisory are focused on the future, to assist organisations move ahead in times of change.